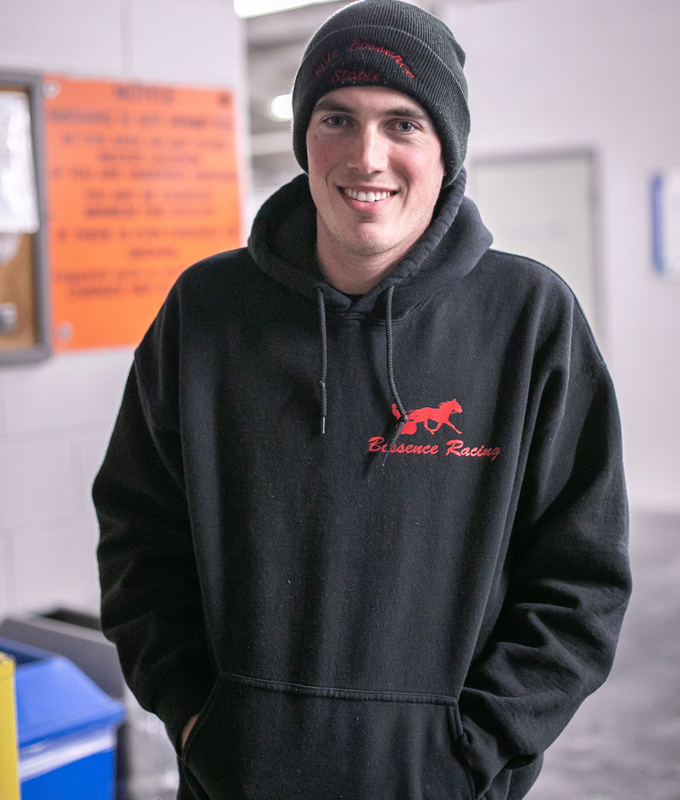 Kyle Bossence: "It's always been about the horses for me"
Standing just inside the main door of the Western Fair Raceway paddock, the 27-year-old trainer is minutes away from starting his night at the London, ON oval. Bossence will send out a trio of horses on a cool, but not uncomfortable evening at the racetrack. The native of Arthur, ON, a community of just over 2,400 people that’s situated about 130 kilometres northeast of London, is in the midst of his most successful year to date. As of December 2, he’s recorded 38 wins as a trainer, accompanied by nearly $220,000 in earnings. Both are career-best marks for the horseman who started out in 2016, a year in which he won a single race, along with three thirds, from nine starts. That he’s found his calling in horse racing is hardly a surprise. For as long as he can recall, horses have played a prominent role in his life. “I’ve always been into horses,” he said. “My grandfather (Lloyd) was involved in the sport and my dad (Ron) was, too. I was always riding ponies. I started with ponies and then gradually got into the Standardbred side of things. Bossence’s first win as an owner came with a horse by the named of Kukalaka, a pacing son of Dragon Again. Which is an apt way to describe his three years in racing. While his foray as a trainer and owner started out in modest fashion two years ago, his sophomore campaign gave a glimpse of what was to come in 2018. In 149 starts in 2017, Bossence won 16 races, along with 59 top-three finishes. When talk turns to this year, he sports a big grin. Bossence is rarely rankled by a winless night. Although he’s been in the sport a short time, he understood the highs and lows of racing the day he sent out his first horse. He’s hoping one of those moments comes in the Battle of Waterloo, a stakes race for freshman two-year-old colts that will celebrate its 22nd edition in August at Grand River Raceway. For now, Bossence is focused on the task at hand. With less than an hour left before the first race at Western Fair, he has to make sure his trio of starters is ready for their respective races. Before he heads off, Bossence offers up some advice to people considering joining the horse racing ranks. Something he’s reminded of as he looks towards the track and the horses warming up before first post.